Marvel's Black Panther has been dominating at the box office since opening in theaters last month, becoming the first movie since Avatar to win five weekends in a row, but now its box office reign has finally come to an end. Black Panther slipped to second place with $16.6 million in its sixth frame this weekend, being dethroned by newcomer Pacific Rim Uprising, which won with an estimated $28 million. Black Panther's run is still far from over, but it's reign at the top has come to a close. Black Panther played in 3,370 theaters this weekend, dropping 464 theaters from the previous weekend, falling just 37.5%, which is quite impressive in its sixth weekend, with a $4,394 per-screen average. This weekend's haul brings its domestic total to $630.9 million, pushing it past 2012's The Avengers to become the highest-grossing superhero movie of all time, and the highest-grossing MCU movie as well. It's $1.237 billion worldwide tally is still not a record-breaking tally, but it is still quite impressive nonetheless. 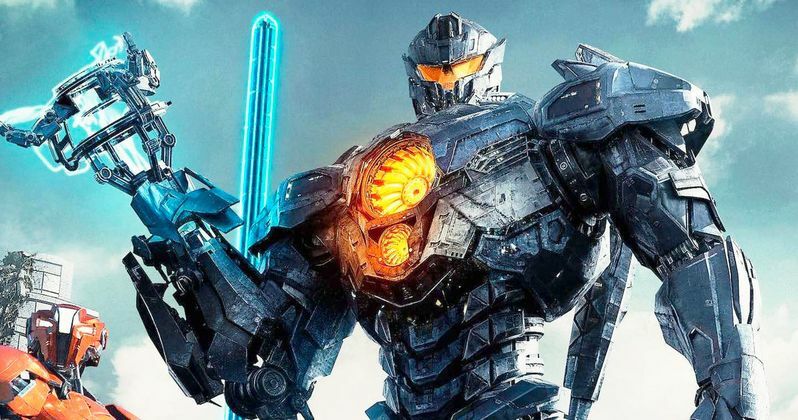 Pacific Rim Uprising managed to take the top spot while failing to impress the nation's critics, with the movie earning just a 46% rating on Rotten Tomatoes. The movie opened in 3,708 theaters this weekend, pulling in a solid $7,552 per-screen average. It also managed to score a big opening weekend internationally, pulling in $122.5 million bringing its worldwide tally to $150.5 million, almost exactly matching its $150 million production budget. This is not terribly surprising since the first Pacific Rim did better in China than it did in the U.S. but it remains to be seen how the movie will continue to fare both at home and overseas. Rounding out the top 5 is the surprise hit I Can Only Imagine in third with $13.8 million, dropping just 19.1% from its debut last weekend, after adding 624 theaters to bring its count to 2,253 theaters. It has currently taken in $38.3 million from just a $7 million budget. Sherlock Gnomes, a follow-up to 2011's Gnomeo and Juliet, debuted in fourth place with $10.6 million, earning just a $2,895 per-screen average from 3,662 theaters, with Tomb Raider dropping to fifth with $10.4 million. The top 10 is rounded out by A Wrinkle in Time ($8 million), Love, Simon ($7.8 million), Paul, Apostle of Christ ($5 million), Game Night ($4.16 million) and Midnight Sun ($4.11 million). Newcomer Unsane, which director Steven Soderbergh shot on an iPhone, debuted just shy of the top 10 in 11th place with $3.8 million, earning a paltry $1,907 per-screen average from 2,023 theaters. Debuting in limited release was Fox Searchlight's Isle of Dogs, which earned $1.5 million from 27 theaters for an impressive $58,148 per-screen average, Final Portrait which earned $28,214 from three theaters for a $9,405 per-screen average and Getting Grace which took in $107,676 from 60 theaters for a dismal $1,795 per-screen average. You can take a look at the top 10 below, courtesy of Box Office Mojo, and check back on Tuesday for next weekend's predictions.